Make your favourite coffee drinks at home with speciality coffee syrups. A set of 5 different flavours in a presentation gift pack. Free recipe and 2 limited edition coffee stencils. There are so many options to try when it comes to syrup flavours and it can become overwhelming. This gift set of 5 is the perfect introduction to the most popular flavours and is sure to get your started in the world of syrups. This set allows you to re-create your favourite hot drinks at home, from gingerbread lattes to hazelnut cappuccinos. This would be a perfect gift for a loved one or a great way to treat yourself. Heat your milk up in the microwave until it is a little frothy, use as much milk as you would like (depending on the serving size). Add in your freshly brewed coffee. Add this mixture into a blender with some ice and blend until smooth. Add some caramel syrup (to taste) and blend again. Pour into a glass, add some whipped cream and enjoy! Smoothies – Vanilla pairs so well with fruit and is a great addition to any smoothie. Ice cream – Drizzle this over ice cream to make your bowl extra special. Coffee – Experiment with how much sweetness you like in your coffee. Tea – If you’re a tea lover this product is not limited to just coffee. Dessert – Added to cake mix, drizzled on pancakes or mixed with a brownie batter, this flavour is so versatile! 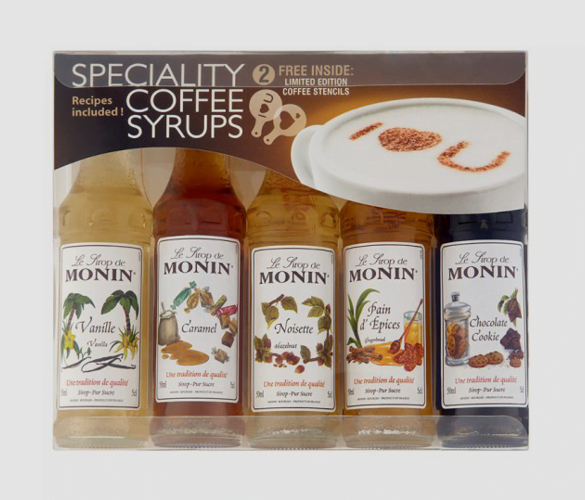 Another one of the most popular flavours Monin has to offer. It is not hard to see why, with this delicious hazelnut flavour having a subtle touch of almond and vanilla. The fresh, floral and nutty notes are simply irresistible and work together in so many different recipes. You can find a delicious recipe for Hazelnut hot chocolate on the Monin website here. Hints of cinnamon, clove and molasses combine to create this delightful gingerbread flavour. Popular in Winter time, however we enjoy it in our coffee all year round. Unique spices and sweet notes work together to give an enticing aroma. You can find two brilliant recipes using this syrup in the description of our DaVinci Gingerbread Syrup. This flavour is unique and luxuriously rich. This is different from a regular chocolate syrup because of the addition of a delicious biscuit flavour. An aroma of cookie and a touch of caramelised sugar will fill your kitchen when making a hot drink. With four classic flavours in this gift set, this unique syrup will be a fantastic addition to your collection.